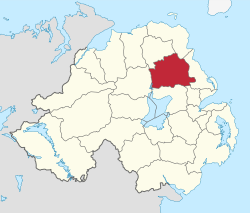 Ballymena is a former local government district with borough status in Northern Ireland. It was one of twenty-six districts created on 1 October 1973 and covered the town of Ballymena and the surrounding area which includes small towns including Broughshane, Cullybackey, Galgorm, Ahoghill and Portglenone. The borough has an area of 200 square miles (520 km2) and a population of 64,044 according to the 2011 census. The borough had a central location within Northern Ireland and is served by the M2 motorway and with a station on the Belfast-Derry/Londonderry railway line. Belfast International Airport itself is only 18 miles (29 km) away and the Belfast City Airport is 30 miles (48 km) from Ballymena. It was also accessible to the seaports of Larne and Belfast, 20 and 27 miles (43 km) away respectively. As of 2015 it has been replaced by Mid and East Antrim Borough Council. Ballymena (borough) Facts for Kids. Kiddle Encyclopedia.